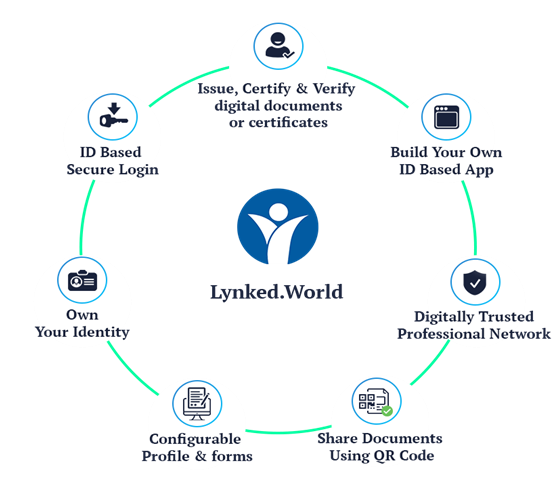 Lynked.World, aims to overcome the “trust barrier” in digital identities, data and documents with the help of a blockchain based application development platform. 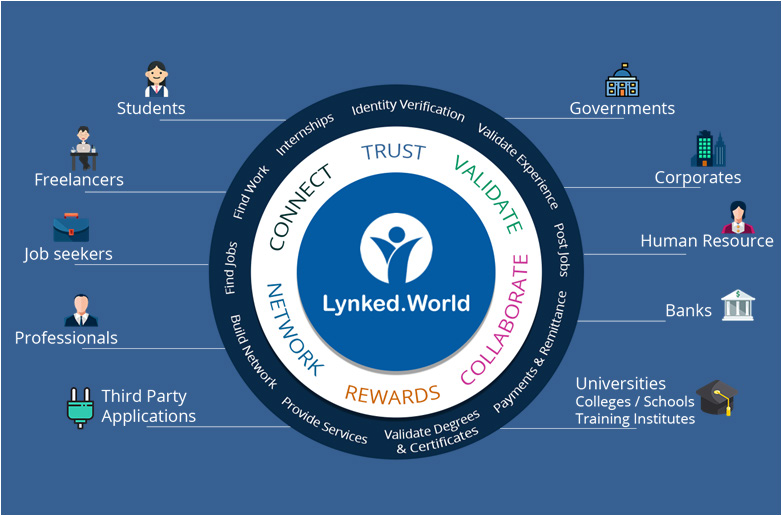 Lynked.World’s vision is to ensure that trustworthiness of digital identities, data and documents is transformed from a question mark to a veritable asset, using blockchain technology. The project aims to provide a fully functional ecosystem, with provisions for developing easy to use configurable forms, and entirely new applications deployable by any organization on need basis – providing relevant and tailored services for consumers focusing on a plethora of scenarios from daily life. Consequently, this would reveal many new explorable avenues for services that can be offered using our stage. “Trust” is now a dependable friend on our side, the veracity of our digital persona being inherent and embedded in our offering. At Lynked.World we are motivated to contribute to the next version of the digital age (Web 3.0) by building an ecosystem to harness the benefits that decentralized applications built on blockchain platforms provide. Our aim is to provide a multi-faceted solution comprising of an entire application platform based on blockchain. This will allow businesses to build customized forms and applications to cater to their own specific needs for providing different services to consumers, without needing to be concerned about the authenticity of the digital identities of the different entities involved and the data and documents shared by these entities. The journey does not end here. We also provide decentralized applications ready to be used by consumers and businesses alike across different domains for addressing issues related to digital data authenticity. The LYNK token is an ERC-20 standard token built on the Ethereum platform. It is fractionally divisible, transferable and fungible. LYNK tokens will also be tradeable on cryptocurrency exchanges in due course of time. “LYNK” tokens will be used for transfer of “value” for any services offered and availed of over the Lynked.World application platform. They act as the medium of compensation for the transfer of “value” between the participants in the ecosystem for performing various transactions, for example, related to the identification and validation of user data and so on.